Everyday, thousands of Correction staffers go past the carved-in-stone name of a Commissioner who can be considered the Father of both the Correction Academy and the Rikers Island jail complex -- Richard C. Patterson. The words "Hon. 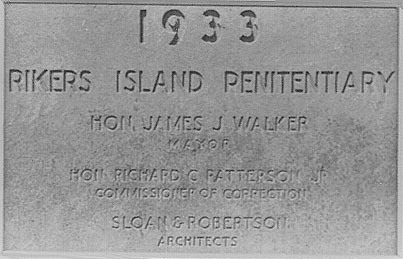 Richard C. Patterson Jr. Commissioner of Correction" appear immediately below Mayor Jimmy Walker's name and title on the 1933-dated cornerstone of what is now known as James A. Thomas Center but was then the Rikers Island Penitentiary. Yet mention of him would draw little recognition from those working in the settings he played so major a role in shaping. But at one time the name held great potential to be long remembered. Patterson's pre-World War I executive service with the Fire Department, his distinguished WWI military record, his administrative work for the peace negotiators, his help in organizing the American Legion in Paris, and his much-praised performance heading the city jail system from August 1927 through October 1932 prompted a Fusion offer to nominate him as the reform coalition's 1933 mayoral candidate. He declined. Instead, Patterson decided to remain as executive vice president of the National Broadcasting Company. The mayoral nomination went to Fiorello H. LaGuardia whose name would later identify the airport from which jet planes roar daily over the island that Patterson as Commissioner had turned from a farm/landfill work camp into a modern prison complex. 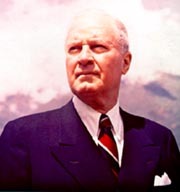 After four years of helping to revitalize NBC, Patterson accepted assignment by President Franklin D. Roosevelt as assistant secretary and later undersecretary of the U.S. Department of Commerce, handling sensitive anti-trust investigation matters and winding up virtually in charge of the agency during its secretary's absence. Patterson again left government service for the private sector in 1939, becoming board chairman of Radio Keith Orpheum (RKO). But when World War II broke out, he was "loaned" to the Treasury Department where he headed up the war bonds drive in New York. 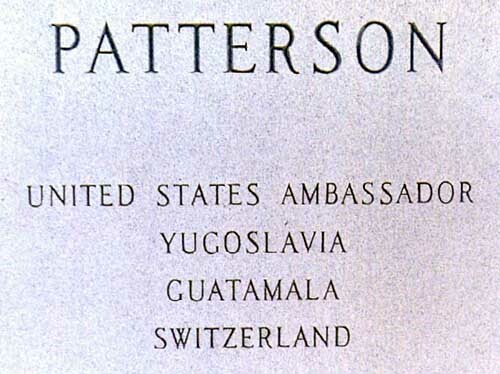 In 1944, President Roosevelt named Patterson as ambassador to the Yugoslav government. He first worked with exiled King Peter and then with Marshal Tito. The New Yorker was later also named ambassador to Guatemala and Switzerland. He was tapped in 1954 to chair Mayor Robert F. Wagner's Reception Committee, a post that eventually evolved into Chief of Protocol, Commissioner of Public Events and Commissioner of Commerce. For the next 12 years, Patterson was a highly visible member of Wagner's Cabinet, serving as the city's chief official greeter, welcoming and escorting dignitaries and celebrities, foreign and domestic, on their visits to the Big Apple. Although he had come a long way from when he had worked as a day laborer in South Dakota mines, the Commissioner continued his membership in the miners union throughout his life. He not only retained the union card, he also kept faith with its spirit. As Correction Commissioner he sought and secured better pay and benefits for the keepers and matrons, listing the increase as "by far the most important accomplishment" and bluntly calling it "the first tangible indication that prison keepers have had for many years that their work was considered sufficiently hazardous and important to justify a living wage." Little wonder then that a Correction union magazine proclaimed, "Commissioner Patterson has the honor of being the first Commissioner in the history of our Department who came out in the open, declaring himself in favor of organizing prison employees, advising them to band themselves into a national organization." The Commissioner gave considerable prominence in his annual reports to what apparently was one of his favorite projects, the Prison Keepers School begun in 1927, the forerunner to the current Correction Academy. "The school for prison keepers . . . is the first of its kind in the United States," he wrote. "Since it was organized the State of Massachusetts has started such a school and just recently the Federal Government also inaugurated one which was patterned very closely after our own. In fact we furnished the government with much information concerning the curriculum and the method we use. . . .
"The course is an intensive one of eight weeks duration, half the day being devoted to instruction in various aspects of prison administration and the remaining half to physical training, drilling, swimming, jiu-jitsu, the handling of refractory prisoners and things of like nature. . . . We are having this curriculum printed in booklet form for distribution, as we have received many requests from prison officials throughout the country . . . nothing that the Department has ever done, at least in recent years, has excited such much widespread interest outside of New York. "The school last year was held in the Police Academy and police instructors assisted our own men in the operation of the school. This year (1930), however, we have moved the school to a large room at the Penitentiary on Welfare Island and have placed it in complete control of our own officials. We are also working on a plan to take over the physical instruction of our men, hitherto given by members of the Police Department, so that we soon will be able to go 'on our own' in this department of the school as in others." For more than five years, Commissioner Patterson -- who held a Columbia University School of Mines engineering degree -- guided the planning, design and construction of the Rikers Island Penitentiary complex to replace the antiquated one on Welfare Island (formerly Blackwells Island and now Roosevelt Island). In anticipation of his presiding at its opening in 1933, his name was carved into the cornerstone placed into the building while he was still commissioner. But he left DOC in late 1932 to take the NBC post. Nevertheless, his stamp of personality, as well as his name, is on the structure. His management skills, engineering knowhow and drive brought the project to completion within projected budget and time parameters. The Penitentiary and its companion building, the Rikers Island Hospital (now North Infirmary Command), were the first major prison facilities to be built on the island. Previously, inmate housing consisted of mostly barracks for the farm work gangs. For many years, the Department ran a Rikers farm program for inmates with narcotics problems and others who, as the theory then went, would benefit from plenty of healthy outdoors activity. Commissioner Patterson wrote, in his 1930 annual report, that the Rikers Municipal Farms' inmates were employed in:"filling in a large basin lying between the institution and the garbage dumps of the Department of Sanitation, which will reclaim valuable land; "raising farm products for the different institutions; "unloading coal boats for the Department of Plant and Structures; "performing manual labor on the garbage dumps such as laying railroad tracks and water lines and unloading barges of material and coal; "raising pigs, there being about 500 of the later . . . at the present time." Under Patterson, the island was transformed from essentially a rural penal colony to an urban prison complex. Late in his life, the Nebraska-born New Yorker lived at the Waldorf Astoria. In early 1966, he took on a nonsalaried assignment as New York City Council President (and gubernatorial candidate) Frank O'Connor's liaison to the business community. 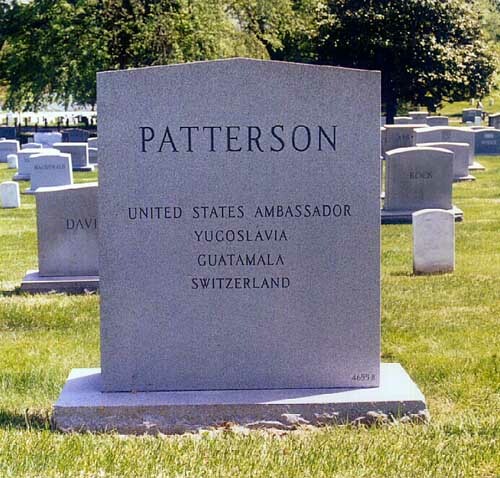 In October of that year, Ambassador/Commissioner Patterson died in New York Hospital at age 80. Burial took place in Arlington National Cemetery with full honors. 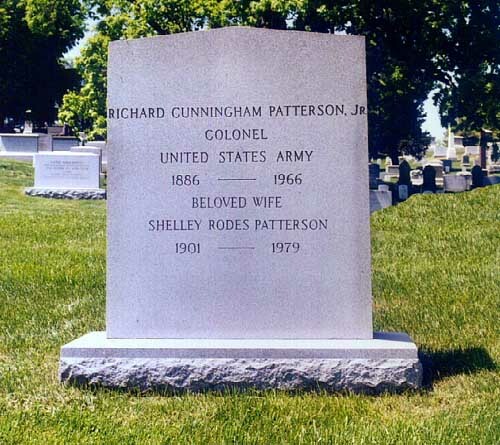 A mining engineer, Richard C. Patterson joined the Pershing expedition to Mexico as a Cavalry private. 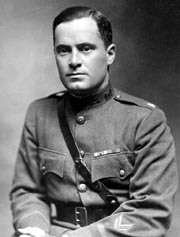 During WWI he served as an Engineers captain and major with American forces in France. NEW YORK, New York, October 2, 1966 – A funeral service for Richard Cunningham Patterson, Jr., former Commissioner of Public Events and Chief of Protocol of New York City and for 12 years it’s Official Greeter, will be held Tuesday at 11 A.M. in Christ Church (Methodist), 520 Park Avenue, near 60th Street). Burial will be in Arlington, Virginia, Cemetery. Mr. Patterson, who several times in his business career left high positions to take administrative public offices, died Friday night in New York Hospital. He was 80 years old and lived at the Waldorf Towers. He was Ambassador to Yugoslavia from 1944 to 1946 and earlier Ambassador to Guatemala and Switzerland. Mr. Patterson was Executive Vice President of the National Broadcasting Company from 1932 to 1936 and Chairman of Radio-Keith-Orpheum from 1940 to 1944.